It’s not always easy to arrive at a location at the right time – often the light isn’t right, or the angle of the sun too high, or the colours too dull. While there’s no substitute for nailing the shot in-camera, if you want to change the mood after the fact there are a few tools in Photoshop that can help. In this tutorial we’ll explain how to totally alter the atmosphere in our woodland scene here with a combination of brush skills, layer blending modes and adjustment layers. 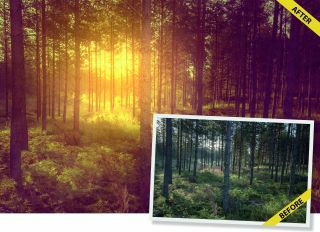 With these simple tools, you can change the colours to give the scene a dreamy atmosphere, add in spots of flare, and even suggest mist floating through the forest. We’ve suggested specific colours and settings for you to try out, but bear in mind that these are tailored to our image here, so if you want to use similar techniques on your own scenes then it’s worth experimenting with different shades until you hit upon the right look. Once you’ve created an effect like this it’s easy to go from day to night. First, add a Gradient Map adjustment layer (as in Step 1) and then customise the gradient so that the blend goes from black to dark blue (try #455E78 here). Next, fine-tune the lightness of the image using a Levels adjustment layer until it looks suitably moody. Finally, hit Ctrl/Cmd+Shift+Alt +E to merge a copy of all the layers, then grab the Burn tool, with Range set to Midtones and Strength at 20%, then paint to darken down the foreground, gently hiding the details that would naturally be in near-darkness. Go to the Layers panel, click Create Adjustment Layer and choose Gradient Map. Click the gradient strip, then double-click the ‘colour stop’ icon at the bottom left. Choose a purple (#472084) and click OK. Now open the colour stop icon opposite and choose a yellow (#FFD200). Reduce the opacity of the layer to 25%. Click Create Adjustment Layer and choose Solid Color. Select a purple tone (#320227) and click OK. Set the layer’s Blending Mode to Exclusion. Add a Color Balance Adjustment Layer with extra red and yellow in the midtones and highlights. Click Create New Layer and set the Blending Mode to Linear Dodge (Add). Next, grab the Brush tool, right-click, and set Hardness to 0. Set the foreground colour to a greenish tone (#696310 here) then, using a fairly large brush size, click once to add the flare. Add a new layer, set Blending Mode to Linear Dodge (Add), choose a brown (#695310), paint a couple of spots to add to the flare effect. Click Create Adjustment Layer, choose Curves and drag down to darken. Paint over the flare with the Brush tool to hide the darkening effect. Add a Threshold adjustment layer set to 120, merge all layers (Ctrl/Cmd+Shift+Alt+E), delete the Threshold layer and highlight the new layer. Go Filter>Blur>Gaussian Blur, Amount 10. Go Filter>Blur>Radial Blur, Amount 100, Method: Zoom, position the blur on the flare. Change the Blending Mode to Screen, then lower the opacity to tone the effect down. Click the Add Layer Mask icon then grab the Brush tool. Set the colour to black and hit 4 for 40% opacity then paint to gradually tone down the blur effect so that it stays subtle.